Ukrainian firefighters have said flames in the forests around Chernobyl’s exclusion zone have been put out and there is no radiation threat. However, locals recall the 1986 catastrophe and fear that just as then officials are concealing the truth. 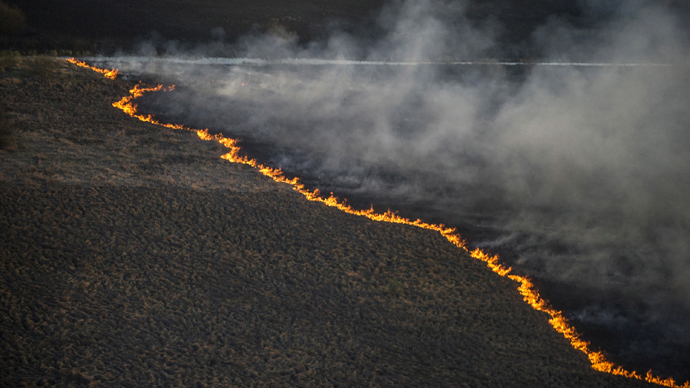 On Saturday, Ukrainian emergency services said that firefighters have managed to extinguish the fire that has been raging through forests in the Chernobyl exclusion zone since Tuesday. “The fire was localized at 10:30 April 29. The fire was extinguished at 9:00 May 2,” said a statement from the emergency services. The forest blaze that came within 30 kilometers of the abandoned Chernobyl power plant, triggered an emergency operation, with police and National Guard mobilized to bring the flames under control. The level of background radiation where the fire was reported has been registered to stand at 21 microroentgen per hour, with the safe level up to 50 microroentgen per hour. However, people in the area are concerned that the fumes from the fire are radioactive. “Nobody has warned of anything. Everybody is working, children are on the streets. There have been no warnings at all,” a local man from the village near the Chernobyl exclusion zone told RT. “We have no information. We don't know how dangerous it is. We have two kids, they are 6 and 10 years old. We don't know if it's dangerous or if we have to run...” another local added. While officials assured the villagers that there is no radiation threat in the area, an expert has confirmed to RT that such fears are justifiable. The fires in the exclusion zone are dangerous and everyone understands this, Yury Bandazhevsky, a scientist working on sanitary consequences of the Chernobyl disaster, said. If the trees, which have been absorbing radioactivity for almost 30 years, are on fire, then radioactive elements “may spread with wind over long distances,” he said. Chernobyl Nuclear Power Plant’s reactor exploded on April 26, 1986. As a result of the explosion and fire, a huge radioactive cloud spread into the atmosphere, covering thousands of miles of Soviet and European territories. Not only was Ukraine affected, but also adjoining areas in Russia and Belarus. Radiation spikes were recorded in Sweden, Norway, Austria and Finland. Approximately 100,000 square kilometers of land was significantly contaminated.